As a trainee of Santa Company, Noel White prepares for her test to become an official Tonttu, her assignment being "To find the most important thing for a Santa Claus." The deadline nears with an answer yet to be found, when a single letter from a child arrives late at the company. As the letter is about to be handled as a defect, Noel and friends set out on an adventure for the present - but will Noel find the answer to her assignment? Santa Company was funded through a successful Kickstarter campaign in 2014. "What is the most important thing for a Santa Claus' job?" A short adventure of an apprentice tonttu, Noel, looking to finding her answer to that question. A holiday movie focusing on one particular journey that Noel and her friends at the Santa Company make on one fateful Christmas night. For such a compelling premise of Noel's loneliness and a distanced father, I thought an opportunity was lost by leaving such relevant flashbacks out of the movie. But that's dwelling on what could have been and not the present that was delivered to us. Given the brief length of the movie, the simple relationships between the characters were pleasant to watch. The part where Santa Company really excelled. The character designs were varied and the animation well-done. The environment and locations were pretty and the action surprisingly intense at times. And a ChouCho song in the ending. Cute characters for a cute Christmas movie. Not much of a backstory for any of them but their interactions were fun to watch. I rather enjoyed this ambitious project by Kenji studio. It's not a social commentary on the holiday season one might have expected but a lighthearted adventure of one girl's determination to discover what it means to be a part of the Santa Company. Santa Company is a simple anime story about a simple question of "What is the most important thing for a Santa Claus" and it answers it in a deadline ride to answer that question. Hello and Merry Christmas (when LA wrote this anyways) and welcome to LA's Christmas Anime review of 2016. Let's talk characters, Noel White voiced by Ayumi Fujimura is essentially the catalyst to how this Christmas story is taken place, with Bell Crystal voiced by Yuki Kaji, Thomas Dou voiced by Rie Kugimiya and Mint Rondo voiced by Haruka Tomatsu helping Noel to find the present as well as meet the child who brought them the letter. There isn't much of characterization besides some stereotypical attributes to them, all merely because of the deadline assignment looming over these four characters. Bell is the level-headed one, Thomas the reluctant but helpful one, Mint being friends to Noel but also causes a small rift between them because of the assignment Noel was given, but it's merely glanced over afterwards. The characters aren't really what moves this plot forward as it's the plotline of the assignment. Really for a simple story about Christmas and having 20 minutes to do it in, LA really didn't mind it, as the journey itself was better than the destination. To be frank the "answer" to the assignment was predictable but still had that "spirit of Christmas" theme to go with it. The journey these four took was probably the best part of the 20 minute run though it had it's strengths and flaws too. The strengths just rather came outta nowhere and seriously THEY START PACKING HEAT, that's as much of a hint LA will say and it was crazily awesome in that regard, the other is in this anime special's theming of Christmas, it may be simple and slightly predictably cheesy but still that in itself is a strength nonetheless, the flaws came from sudden rift between Mint and Noel to cause drama when it really didn't need it. LA isn't even gonna blame the weak characterization as firstly, it was based after a novel, secondly and lastly, the runtime, so it's passed as LA giving it a bit of grace on that part. Where LA isn't however is in the other problem is that since this anime special is based on the events after the novel it is based on, this anime special dumps you right into it and to those who haven't read the novel are completely clueless to both the setting and it's "already defined" characters especially at the start but worse from it's stereotypical defined characters. In terms of animation by Nexus, the character designs had it's festive themes to it and LA quite enjoyed looking at the watercolored-pastel backgrounds and the rather unique "Christmas" aesthetics it put to Santa Company (both the actual in-universe company and the anime itself). Character designs were ok at best as they are decent enough but only remembered them by their hair color at best. Really, animation was at it's best in it's backgrounding and Christmas theming it did. In terms of seiyuu's, well LA got a bit "they sound similar" with this cast, at first LA thought that Rie Kugimiya was voicing both Mint and Thomas (as LA immediately took notice of Rie Kugimiya's little boy vocals, but at times Mint sounded very much in the range of Rie Kugimiya's typical tsundere vocals to almost sounding like Kanae Ito!). Oooohhh sorry once again Ayumi Fujimura but you along with Haruka Tomatsu both had some squeaky yet annoying vocals at times, Ayumi through Noel's shouting and Mint during the "rift". Seriously Ayumi Fujimura, first Seiken no Blacksmith now Santa Company, ahh well at least Noel got better by the final scenes of Santa Company. *ahem* got off in a tangent, LA's favourite voice actor would just go to Yuki Kaji as Bell Crystal as it was Yuki Kaji doing his stuff really, LA aside, there is some squeak from those two but nonetheless, the vocal cast is "ok to decent" at best but nothing to get TOO annoyed over and again the runtime can make you forget that. 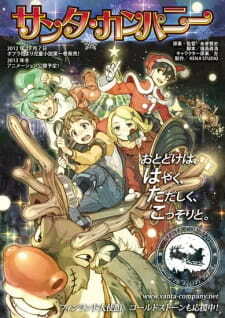 Santa Company, for what it presents is a feel-good anime Christmas special, that has a simple tale to tell and it tells it pretty decently all round, yes if LA takes this story too critically, it has it's problems, but for it's themes of Christmas and what the main reasoning as to WHY this anime's plot purpose is, then it succeeded. Christmas is a time for being with friends and family, giving gifts, and all around good feelings. And one of the ways of getting into the Christmas spirit is a good Christmas special. Its a good way to get the family (and friends) together to enjoy something with each other. Besides the gifts and food of course. And one of the things that you can enjoy is Santa Company. Santa Company is an anime short film from 2014. The short started out as a crowdsourcing campaign on the Japanese site Anipipo by Kenji Studio, a company started by the director of the short, Kenji Itoso. It's original goal was 1 million yen, and unfortunately it fell short of that goal. It was later re-launched on kickstarter for the lower amount of $50,000, which it managed to surpass, which i am glad for, because this short was a real surprise. The story follows a trainer of the Santa Company, Moel White, as she prepares for her test to become an official Tonttu, with her assignment being "To find the most important thing for a Santa Claus." As the deadline for the completion of this test draws closer, a single letter, a wishlist, from a child arrives late at the company. Soon, Noel and her friends set out to try and deliver the present before it's too late. Being just less than 30 minutes long, there's not enough wiggle room to try and talk about much of the story after the initial premise, so i won't talk too much about it other than to say that even thought it's simple and a bit cliched, it is appropriately adorable and it's worth checking out. It definitely doesn't overstay it's welcome with it's short run time, like a lot of other Christmas movies do. There isn't an English dub, but i didn't expect one because of it's meager budget, so it does limit it to kids who can read. But i figure there are enough of those who still enjoy Christmas specials along with enough adults who don't mind or enjoy Christmas specials aimed at a younger audience that there is an audience for this. It is also definitely nicely animated and it does have an adorable art style. Santa Company might be short, simple, and not bring anything new to the table in terms of Christmas specials, but it's not a bad way to spend half an hour around Christmas for those in the Christmas spirit and kids old enough to read.